If you are unknown of whether to backup DVD or rip DVD in digital format, follow the comparison review between DVD copy software and DVD ripper. Then you will get a better understanding of the two kinds of programs and use them for various occasions. Nowadays, we may more or less own some DVD discs, which may be either purchased from stores or received as special gifts taken by camcorders from friends. However, we may easily find that DVDs can be scratched, damaged and even completely unusable. To solve the problems, DVD backup software and ripping software are therefore available for better protection of DVD library on your computer. But how DVD ripper differs from DVD backup software? 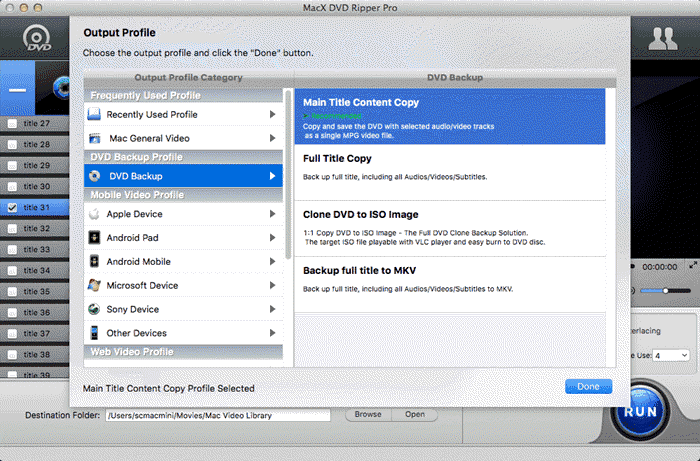 Here I'd like to make a comparison between DVD backup software and DVD ripper for Mac/PC. The name articulates it well. DVD backup software permits you to copy DVD movies to store them on your computer hard drive, NAS or USB in order to play with media player or burn then to vacant DVDs. In the other word, there is almost no codec transcoding involved in the process of copying DVD with DVD backup software. • Since there is no video compression involved, the video quality will be almost untouchable. And the 5.1 channel AC3/DTS dolby audio will be reserved. • DVD information such as video tracks, audio tracks, subtitles, menus and more can be retained well. • DVD backup software generally delivers a superfast speed. Most often, a full DVD disc can be backed up on computer hard drive in less than 10 minutes. • The output file size will be as large as 4-8GB as the DVD content isn't compressed. • DVD backup program generally saves DVDs in MPG, ISO image, or video_ts folder, which is not so much compatible with mobile devices or gaming systems. Different from DVD copy software, it's understood clearly that DVD ripper is a software program that transfers audio/video contents from DVDs into different formats, for instance, the hierarchy of files making up the audio/video data on DVD can be converted into other single file such as AVI, FLV, MP4, MOV, H.264, MP3, and more for playback on media players and portable devices like iPhone, iPad, iPod, Android, gaming systems and so on. • DVD ripper delivers less file size than that of DVD copy software, courtesy of its built-in video transcoding engine. So it is more friendly than DVD backup tool if you want to store more movie files in a space-constrained device. • DVD ripping software can digitize DVD to a diversity of file format, including MP4, MOV, AVI, and more, so that the rips are more recognizable by common mobile phones, tablets, TVs, laptops, game consoles, etc. The DVD quality is degraded to some degree. This is down to involvement of video compression in the process of ripping. As a result, you will notice the DVD content gets pixilated or blurry if it is ripped not so well. • DVD ripping speed is comparatively lengthier than that of DVD backup software. This is because the DVD ripping process involves in decoding and re-encoding, which don't appear in the DVD backup. So if you want a faster process, you have to turn to DVD backup software. Is There Any 2-in-1 DVD Backup and Ripper Software? For a piece of DVD software, the most import thing that you probably concern most is its ability to copy and rip DVD. It is so hard for you to choose the best one from piles of similar products. But if you are looking for a program which is intergrated with both DVD backup and ripping functions, MacX DVD Ripper Pro is no doubt a good choice for you. It is an ultimate DVD backup and ripping program with a strong emphasis on not just ripping normal DVDs but converting copy protected DVDs, which are even encoded with the new Disney Copy Protection. Its unique DVD copy feature lets you back up protected DVD to ISO image, MKV, and MPEG2 with original video quality and original 5.1 channels Dolby AC3/DTS audio in few minutes. What's more, it allows you to rip DVD to MP4, QT, FLV, H.264, MOV, AVI, MP3, MPEG, M4V and other formats which are compatible with not only Apple devices like QuickTime, iTunes, iPhone, iPad etc but also android Samsung, Huawei, PS4 and so on. In addition, the program is able to bypass any copy-protection schemes, say, Disney DRM, CSS, Region Code (1-6), Sony ArccOS, UOPs etc. and rip protected DVD, including new DVD releases, damaged/unplayable DVDs, workout/fitness/Japanese DVDs and many more. Download the DVD to NAS ripper and start to learn the guide below on how to rip DVD to NAS drive. No matter you are willing to backup DVD with full data or rip DVD to specific format for playback on iPhone iPad, free download the 2-in-1 DVD Backup Software & DVD Ripper first. Step 1: Launch MacX DVD Ripper Pro and load the DVD file after you insert the DVD disc to the disc drive. Step 2: Choose the output format. As you want to copy DVD with complete data, you can go straight to "DVD Backup" option where provides you 4 DVD backup modes that enables you to get movie DVDs into MKV with all audios, videos and subtitle tracks, copy selected audio/video tracks in MPG file and even clone DVD to ISO image so that you can easily burn to DVD disc. Step 3: Start the DVD backup process. Click the Browse button to set the destination folder and tap "RUN" button to start to copy a DVD on a Mac/Win. 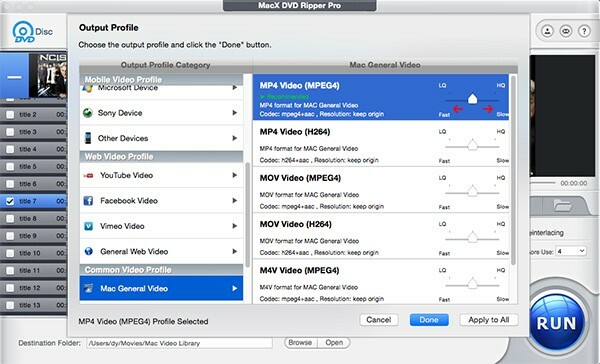 MacX DVD Ripper Pro not just allows users to copy protected DVD with original data, it is also talented in encoding DVD to MP4, MOV, AVI, FLV, etc for iPhone iPad iTunes and Android devices. You can follow almost the same steps as copying DVD except choosing the output format. There are various profiles infused, including Common Video Profile, Mobile Video Profile, Frequently Used Profile and Web Video Profile. You can just choose the video format as per your needs. There is no need to tweak the parameters if you are unclear of them. And then you will get started with ripping DVD to MP4, AVI, FLV etc when you hit the "RUN" button. Test shows it took less than 10 minutes to rip the 2-hour movie Inside Out title 1 to H.264 with AAC on a normal Mac computer, if GPU acceleration is enabled. To transfer the DVD copy file to iPhone iPad, you can turn to MacX MediaTrans. Movie transferring and management are very easy to perform within the iTunes alternative. Notice: We only advocate copying and ripping DVDs under the concept of Fair Use and do not encourage any illegal reproduction or distribution of copyrighted content. Please abide by the local DVD copyright law before doing it. MacX DVD Ripper Pro updates constantly for latest copy-protected DVDs (CSS, UOP, REC, APS, Sony ARccOS, and Disney X-project protection. It enables you both copy DVD to ISO image/DVD folder and rip DVD to MP4, MOV, AVI, WMV etc. with pretty good image quality and fast speed. And this software developer advocates referring to your local country law and ripping DVD to mac for personal use. It supports both copy/backup DVD and rip DVD to specific formats and devices. What's the most impressive is the strong decryption function, allowing you bypass almost all DVD copy encryptions. This Program lacks the ability to burn new DVD discs. DVD Cloner claimed the top spot of the best DVD ripper for Mac because of its simplicity, versatility and high-quality results. It can make exact 1:1 copies of your movies as well as compress commercial DVDs to fit onto smaller-capacity blank discs, not to mention the unique ability to merge the contents of multiple DVDs onto a single Blu-ray disc. This software copies DVDs faster than any other product in our review. Saving a DVD's ISO file to your computer is unnecessarily complicated. Aimersoft DVD Ripper came out to be the top rated DVD decrypter Mac/PC because it's a powerful, easy-to-use program that enables you to rip your video files to various formats like MP4, MOV, MKV, AVI, M2TS etc. and customize them for playback on any device you own. It is a great choice for DVD ripping software. Rip files from your DVD and optimize them for playback on any device, from a computer to a smartphone or a gaming system. It cannot perform a straight rip of raw DVD files such as the ISO or the Video TS folder. Note: The MacXDVD software calls for copying or ripping DVD under the concept of Fair Use and does not encourage any illegal distribution of copyrighted content. Please abide by the local DVD copyright law before doing it. One-click backup and rip DVD to MP4 H.264, MKV, AVI, etc.